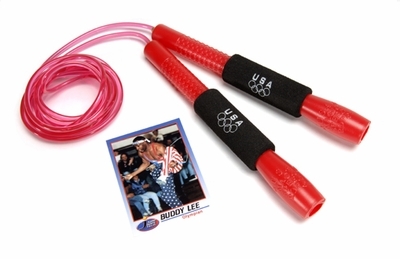 The Buddy Lee Magic Speed" is the first Buddy Lee Hyperformance Jump Rope"! Designed in 1993, it is now rated as the basic model of the Hyperformance Jump Rope" line without the patented swivel bearing system. Its eyelet device allows for fast and smooth turning action, control and easy rope adjustment. It easily out performs all conventional and leather jump ropes. The 8" inch long handles are ergonomically designed to comfortably fit both children and adult hand sizes while executing basic to advanced skills. It comes with a 9" PVC solid and aerodynamic rope cord designed for indoor and smooth outdoor surfaces. It can be custom sized for your height with the help of a pair of pliers (adjustable for people 6' 9" and under). The rope cord is replaceable. For children and adults. Please read instructions inside rope card.